Heating and cooling a mobile home can defer from a standard home. From the installation of a HVAC system to the build of the mobile home itself some things defer from conventional home. 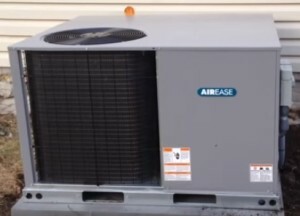 Installation of an air conditioning system into a mobile can often be easier since they are often not set on a slab of concrete and can be accessed from below. This ability to crawl underneath a mobile and run refrigeration lines or duct work make them easy for installs. Build quality also must be taken into account. An older mobile will not contain air as well as a newer model. The same with size as a double wide needs more capacity than a single wide. The climate the mobile is located in is important as well since someone who lives in a humid environment will have a different need than someone in a dry hot environment. So lets look at some popular options for heating and cooling a mobile home. Split systems are A/C units that separate the evaporator inside coil and the compressor/condenser outside. Refrigerant is transferred between the components from inside a home to the outside transferring hot and cold as necessary. 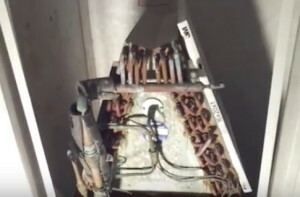 The inside Coil most often looks A shaped and is located inside the bottom of the furnace. Split systems are widely used in mobile homes and use the duct work in place from the furnace to blow cool air in through the vents. Units can be either heat pump or air conditioner only. 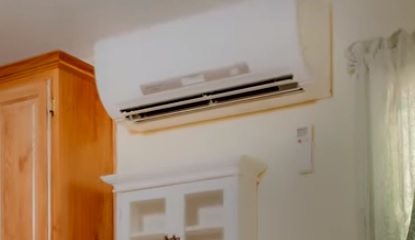 When a unit is air conditioner only the furnace is used in the winter to heat the mobile. Packaged units are fully self contained HVAC systems that come with all the components in one package. Unlike a split system which separates the main components, which than must be put together, a package unit comes setup ready to run. Electricity needs to be setup along with a supply and return air. Most units use 240 volts to operate and need a to be run to a breaker box. Two large square openings are what blows out conditioned air and pulls it back into the unit. The Supply side will need duct work run to a mobile homes existing duct work. The Return Air will need an opening cut strategically for air to be cycled back to the unit, and a grill set up with a filter. A mini split is much like a split system only smaller and can be located almost anywhere. While a standard split system is located in the furnace a mini split can have the inside coil mounted on a wall and lines than run outside to the compressor and condenser. Mini splits can be ideal for a number of reasons including low-cost and easier installation. A mini split can cool a small mobile or cool an add-on that never had air run to it. This makes them very versatile and even have many DIY kits for the handy type of person. Often a mobile home will have 2-3 mini split heat pumps installed which both heats and cools. A high efencly mini split heat pump is likey the best option in many senris sicne they cost less to install and cost less to opeerate. There is many do-it-your self mini split kits that many average home owners install to save on installation cost. Read Here For More On Mini Split Systems. Evaporative coolers sometimes called swamp coolers work well in dry climates. Water when it evaporates cools the air around it which in the right climate works as well as a standard A/C unit. 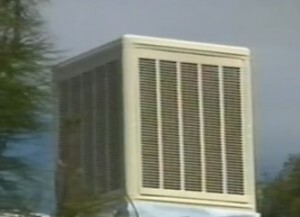 Many south western states such as Arizona or Nevada have many mobile homes that only use a swamp cooler in the summer months. They have the added benefit of being low cost to buy, setup, and operate. Unfortunately they do not work in high humid environments. If you live in a dry climate an evaporative cooler is worth looking at but be ware of its limitations. Finding the right heating and cooling system for your mobile depends on the location, type of mobile, and cost. Each scenario is different and there is not a one-size-fits all solution. Some one living in Arizona may get by simply with a cheap swamp cooler while someone living in Florida will need a air conditioner for the best results. Often times a combination of units are the best solution such as a mobile with an addition will likely only need a mini split system. Mini split heat pump systems are the most popular since they cost less to install and cost less to run while heating an cooling. We purchased a propety with an older trailer on it. The furnace has been taken out. No good duct work I. Floor. What is the best option for heat and air? Can u put duct work in ceiling,? Not sure the cheapest and best way to do this. My living room is always hot. all duct and ac system have been checked and are fine. If i move my air return close to the ceiling on the wall, which is currently located in the living room floor. will it help? It is the only return in the mobile home. It’s interesting to learn that air conditioning can actually be better in a mobile home because there often aren’t cement barriers that mess with ventilation. Although there are many negative stigmas about living in a mobile home, residents have the possibility of better air conditioning because of the availability of quality supplies. It could be beneficial for you to have this perspective when considering what kind of real estate you are looking to acquire.